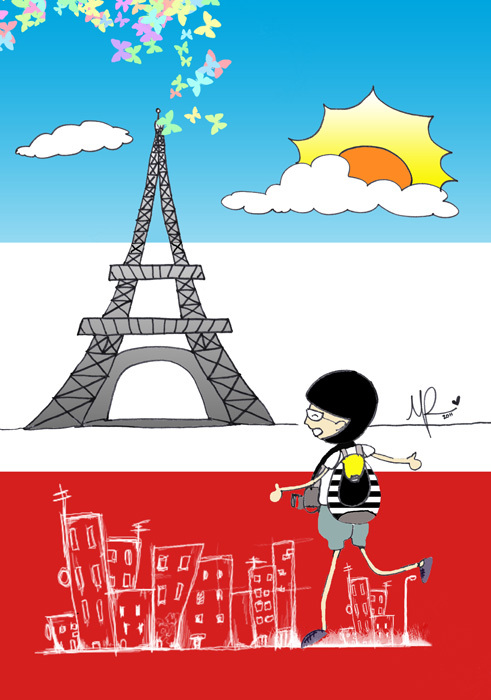 Here I draw him and Eiffel Tower. He said to me that he wanna go to Paris someday. To capture the beautifulness of that city. So, what do you think people? How do you like it? FYI, I am very pleased to receive any comments, critics, and suggestions abot my drawing. Eiffel Tower? Nice happy, young, tourist-ladies..No doubt: Paris. As the Seine, Bois de Boulogne, Rive Gauche, Monmartre, Mona Lisa .. I'm not sure though whether antennas on the roofs are very typical in city of lights :). keren2 deh isi blog-nya. Sukaa..